I’m sending you a picture of a fortune I got out of a cookie about five or so years ago. It’s the strangest fortune I’ve ever received and I thought you might like to see it. 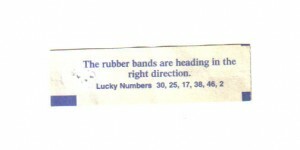 I’ve kept it pinned on my bulletin board all these years because I get a kick out of it and recently I started playing the lucky numbers in the lottery! I think it’s a positive fortune, just a bit out of the norm. I can tell that this fortune is from Wonton Food, which makes half of all the fortune cookies in America, 4.5 million or so per day. Wonton must have had a quirky writer.